We install paver and flagstone patios and walkways, fire pits, water features, segmental wall, sprinkler systems, edging, trees, shrubs, and flower beds. We also install raised bed vegetable gardens, sod, and we seed lawns. 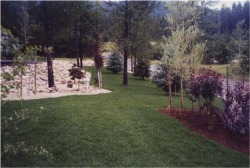 Our trained staff will provide you with a professional installed landscape that you will enjoy for years to come. Increase the value of your home by up to 20%! Did you know that a well planned and maintained landscape can increase the value of your home by as much as 20%? When your landscape has been installed, you can maintain it yourself or let us do the work for you. You may want to consider continuing service with us and let us maintain your landscape for you through our maintenance division. Contact us using the Estimate Request Form or call us at (208) 382-7284. We will schedule a consultation appointment with you, work with you on the design, and present you with a proposal. Upon acceptance, your project will be placed on the calendar and work then begins! Before long, you will be enjoying your newly installed Landscape.